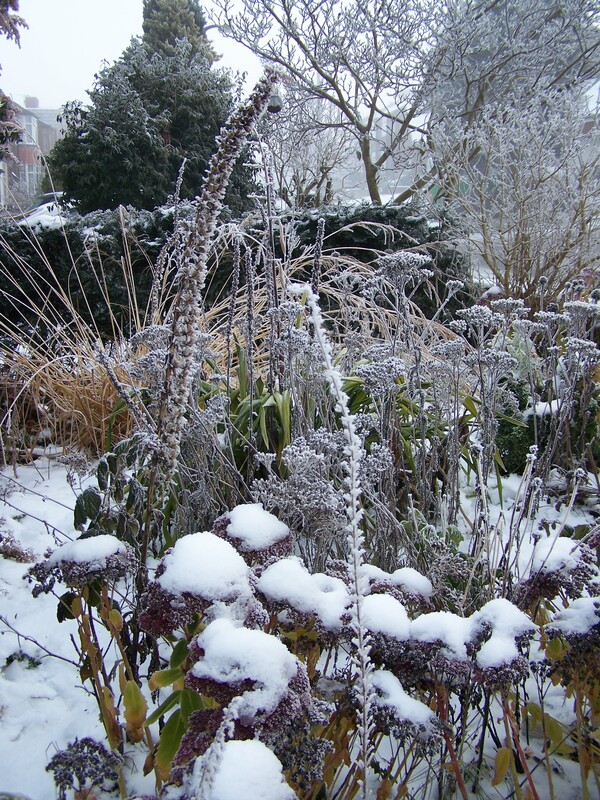 A completely re-hashed version of February’s ‘Planning a Border’ article for BL Magazine. February is a great month. It’s the shortest, evenings are getting noticeably lighter and those cheery little spring bulbs are blooming their socks off. I am always, always taken over by a giddy eagerness to get outside and get to grips with my borders at this time of year. I had planned to get out at the weekend…but the god’s found out… and it rained constantly. Next weekend I plan to stay in and work [I’m hoping reverse psychology might make things turn out nicer]. I have to admit that with my own garden I happen to be a bit sentimental, not with ornaments but with plants. 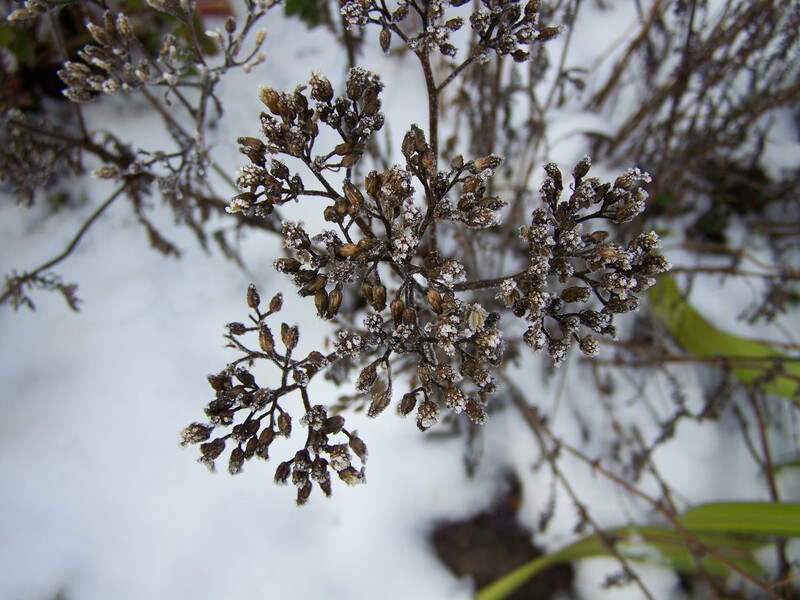 I’m a stickler for perennials [not just fruit] and will purchase specimens in a heart beat. I just can’t help myself. 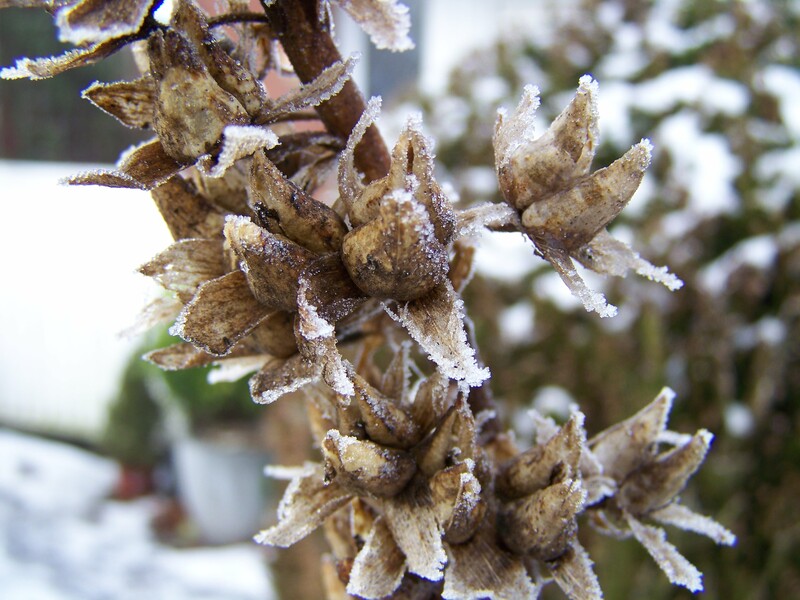 In fact I’ve recently ordered a couple of the new Verbascum ‘Blue Lagoon’…and yet have no idea where they will go! This is a problem and I know I’m not alone in this random plant hoarding. If I had a bigger garden with a designated nursery bed this type of impulse buying could be justifiable…but I haven’t. The result of this type of plant purchasing inevitably creates a border of chaotic clutter and never usually fills you with that content sense of planting equilibrium. ‘I’ll pop that in there’ and ‘Oooo, that’ll squeeze in here’…are just not best practice and should be avoided. 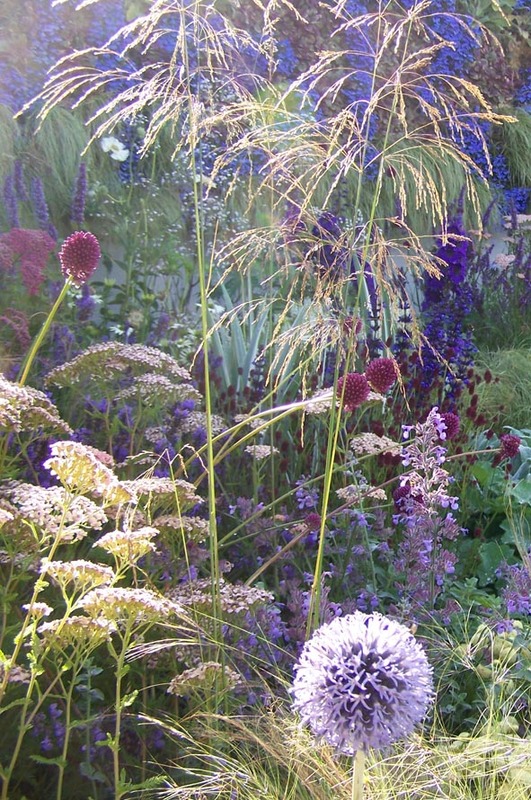 When creating a planting scheme for a client, on the other hand, my approach and method of selection is entirely different. It is focused [thankfully], logical and completely detached from any hint of sentimentality. 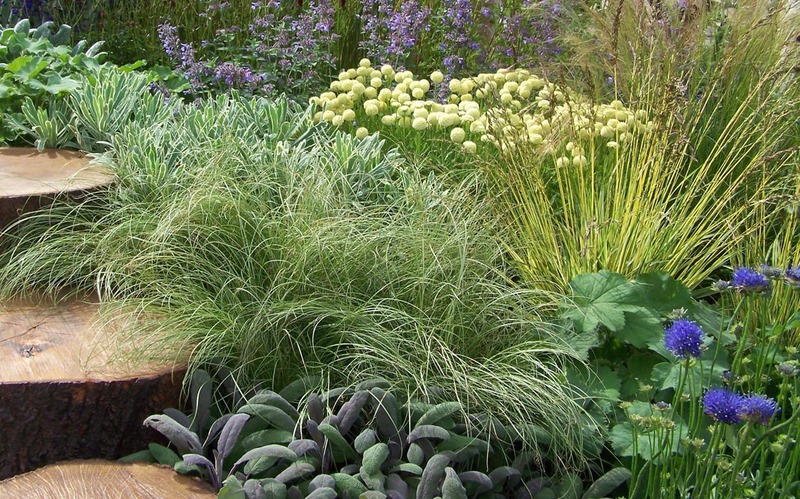 A brief is always developed which in turn gives direction and a theme for the planting scheme evolves…which is hugely important to help keep us on the straight and narrow. This time I am going to apply the same focus and tackle two chaotic borders in my back garden…although I suspect I may have a problem with the ‘detached’ bit. Imaginatively I shall call them ‘left’ border and ‘right’ border. The left border has always been my refuge for ‘nursing’ specimens that have been bought on impulse and desperately need planting. Last year I decided that I would start to incorporate some fruit here and added an ‘Ebony’ black currant bush. I’d like to add more fruit, maybe replacing a rather mature cordyline with a more productive ‘James Grieve’ apple tree or maybe a plum, but I’m not sure I can be that ruthless. The harsh frosts have taken their toll on the cordyline for the second year now…so I’m secretly hoping it may have snuffed it. I would also love to add some strawberries too, but, as the cats use the border as their litter, I think maybe not. Other structure in this border includes a Taxus baccata Fastigiata [bought at just a foot in height and now about 6 foot], a rampant bamboo and a well-behaved one, a metal obelisk with Rosa Albertine and Clematis macropetala ‘Maidwell Hall’, a box ball and…a tree fern. I suppose now would be the moment that I come clean and own up to how the garden first developed. 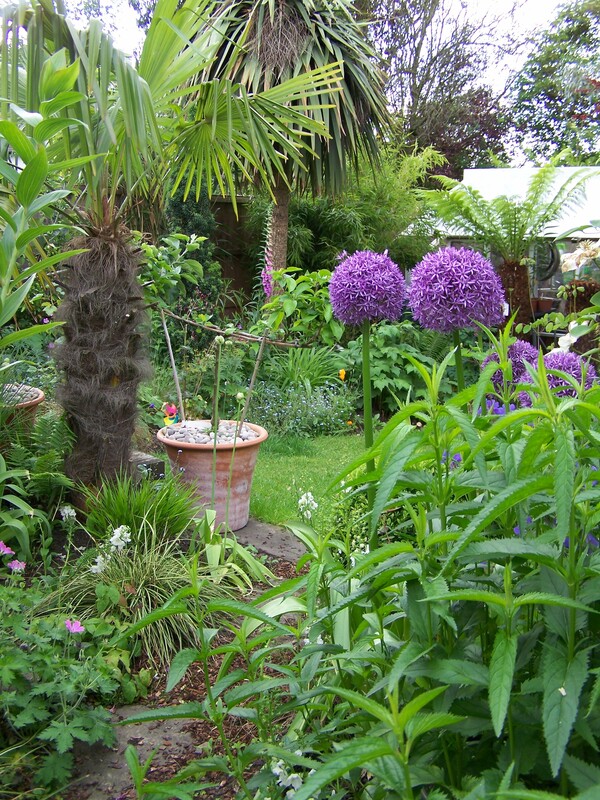 The other half and I fell in love with Cornwall and all the sub-tropical gardens there, in particular Lamorran. We bought our house in Bolton in 1999 and we wed in St Mawes two years later. Subsequently, every trip down there resulted in the inevitable squeeze of a prized tropical specimen into the car to take home to create our own little Lamorran back in the North. The large Agave americana was the most challenging I have to say. Consequently, there are many plants here that I have a certain attachment to and despite my evolving garden style to more productive/naturalistic planting I cannot get rid of these tropical remnants. So they’re staying. 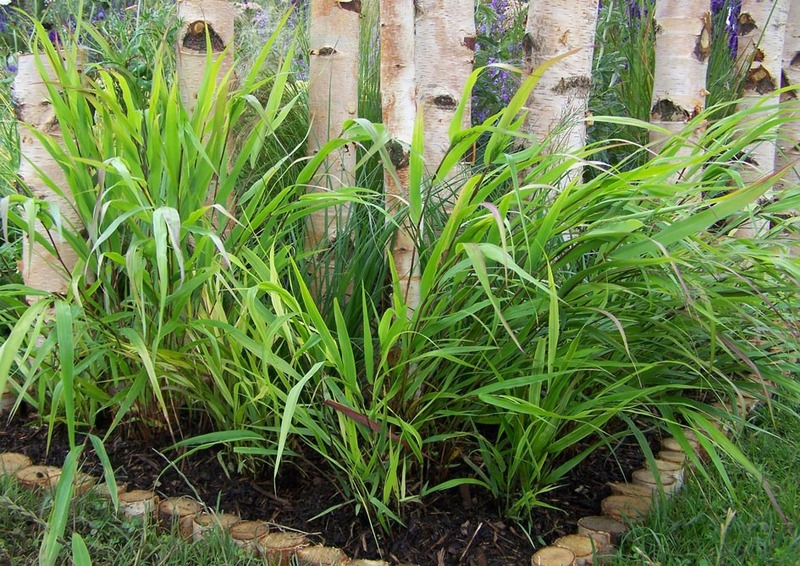 The rampant bamboo, however, can come out, the other can be split and any perennials that don’t fit the new brief can be re-located to borders at Lady of the Vale. White phlox [from Gresgarth gardens in Caton, Lancs]; Cornus canadensis [which took me an eternity to source]; and a tall white anenome [given to me by a customer who is no longer with us] will be staying too. The new brief then…additional fruit… with a mixed perennial and grass planting scheme. I have always wanted to do the all white border for myself and given the white colour scheme of the plants that HAVE to stay…I think this may be the occasion to go for it. I did plant some Allium ‘Purple Sensation’ in this border in the autumn [well around Christmas if I’m honest] which may just have to stay there for now and replaced with ‘Everest’ for next year. The size of the border is about 5m in length and 2 to 3m in depth. At the moment there is a very narrow gravel ‘path’ towards the back of the border. It was originally put in to allow us [and the children] to walk close to the bamboo, re-creating the ‘bamboo walks’ of the grander gardens in Cornwall [and the opportunity to drench the other half by shaking the canes]. In reality the path soon becomes overgrown and the temptation to walk down it is lost. I think it’s time to reclaim this space and increase the precious planting square footage. The soil on this side of the garden is lovely, light and loamy, yet the right side really holds the moisture, is much heavier and despite adding lots of garden compost and manure is still very characteristic of clay. The back also faces North, slightly NNW to be precise. The border is however in the sunniest spot and can get rather dry in the two to three weeks of beautiful, hot, dry weather we seem to get around May! We do tend to get lots of rain here. I think it’s to do with living at the foot of the West Pennines, the weather comes straight in from the Irish Sea and tends to accumulate and huddle around these hills. [It is surprising how much better the weather can be by just travelling down to South Manchester!] With all this moisture, Slugs and snails are a major problem here so any new plant introductions will have to be robust [I have enough hostas for the little critters to be getting on with as it is]. The next step is to start that plant list, do a bit of research and make a proper plan. At least now I have set out my intentions [publicly], admitted that the plant hoarding technique is not at all good and have put into motion yet another project to add to my to-do list! And I haven’t even started on the right border…which is driving me insane as my lovely [and she truly is] neighbour replaced the fence panels in late summer last year… with brown plastic ones. Now that all the leafy foliage has withered and crumbled away these glossy, unnatural panels gleam with intensity. They niggle me constantly and as soon as funds allow I shall be purchasing many bundles of timber slatts to begin the long task of making them disappear! I just need a long dry spell so I can put all my eagerness to good use. I shall report back in the near future to let you know how it all goes.